Despite a fresh warning by the Taliban on Saturday asking Afghans to boycott next month's presidential election run-off, both Afghan President Hamid Karzai and rival Abdullah Abdullah launched the second round of their campaigns, the first step towards bringing resolution to a presidential election mired in fraud and controversy. But will Afghans overcome their suspicions and security fears in order to turn out in enough numbers to bestow legitimacy on this next round? Last week, exactly two months after Afghans first went to the polls on August 20, Karzai announced that since no one candidate, out of a field of 41, had received 50% of the vote, the election would go to a second round between the two highest vote earners. 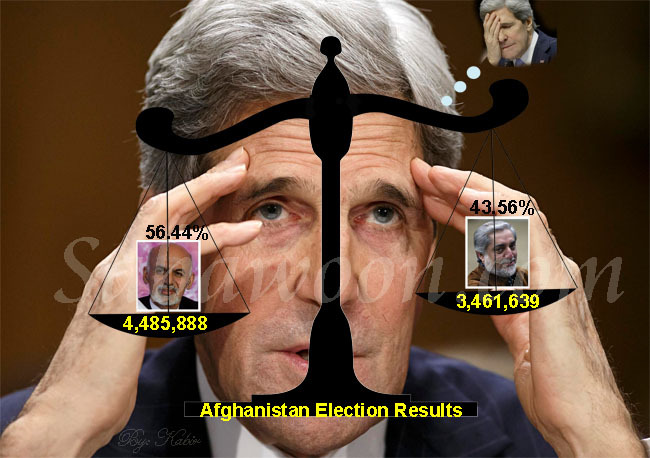 An initial tally of the votes put Karzai at 54%, with Abdullah in second place with 28%, but after more than a million votes were thrown out due to irregularities, the results were recalibrated to 49% and 32%. In a statement emailed to Reuters news, the Taliban threatened to attack polling stations and close roads on the day of voting, saying that the election process was at Washington's behest. "The Islamic Emirate of Afghanistan once again urges their respected countrymen not to participate," the message said, "In order to make this process fail all the mujahideens will carry out operations on the enemy's centers." Nevertheless, election workers, with the help of the United Nations, and in some cases donkeys and camels, began spreading through the country with a fresh batch of ballot papers, tamper proof boxes and indelible ink to be delivered to far flung polling stations. This time, however, the task won't be quite so arduous. Afghanistan's election commission has decided to cut the number of polling stations by about 2,000 out of 25,000 in an attempt to mitigate some of the fraudulent methods practiced in the first round, when stations that never opened due to security fears nevertheless reported votes. The bulk of those stations were in the south and east, where insecurity is highest, but where Karzai has the most support. Election observers have asked for more such stations to be closed, citing fears of continued abuses, but they also recognize the need to balance rural areas' right to vote with the risk of fraud. Haroun Mir, director of Afghanistan's Center for Research and Policy Studies, says such an approach risks alienating the very people a new president needs most to ensure his legitimacy. "If the Independent Election Commission doesn't open sites where the Taliban is strong, they are telling the Pashtuns in the south that your vote doesn't count." The election commission also decided to fire or replace some 200 district election workers, out of 380, whose stations had been implicated in fraud, another positive step that is likely to restore some faith in the process, even if doing so adds to the already considerable logistical difficulties involved. But for many, it is not enough. Both the International Republican Institute and the National Democratic Institute, U.S.-based democracy support NGOs who sent observers to the initial round of voting, cite a need for enhanced security, better monitoring at each station and greater regulation of the use of state resources for campaigning. "Millions of Afghans voted on Aug. 20 despite the threats of violence, demonstrating their strong desire for a government that derives its authority from the will of the people," said NDI in a statement released the day after Karzai's announcement. "Everything possible should be done in the limited time available to apply lessons learned from the first round of polling to ensure that the results of the runoff election meet the desires of citizens and ensure legitimacy for the elected government." Most Afghans, however, say the efforts at fraud prevention will be worthless if people don't turn out to vote. Safora el-Khani, a Member of Parliament from Bamiyan, the mountainous center of Afghanistan, points out that for many parts of her district, which is largely inhabited by a minority ethnic group, it is already too late. Winter arrives early in the mountains of Afghanistan, and heavy snowfall will make it impossible for voters to get to the polls, or for ballots to make it back to Kabul for tabulation. "We will not have access to some polling stations," she says. "In our province the water is already frozen." Even if the weather is not an issue, says Mir, voter apathy is. The long wait for results, political accusations between parties, and a prevailing sense of international intervention have bred cynicism. "In this climate, the turnout will be much lower in the second round. And has anybody decided what constitutes an acceptable turnout to give the government legitimacy? Only five million voted in the first round [out of 12-16 million registered voters]. What if only one million votes are cast this time?" At Kabul University, where election excitement was running high before the August 20 vote, students shrugged off the next round, citing a lack of faith in the process. "We have a problem with these politicians," says Abdul Jabar, 23, a student of Dari literature. "There will be very low turnout because the people have no trust." Ali Farhan, 25, a law student, agrees, saying he won't vote. And Darab Raofi, 20, in the social sciences school, says the whole issue has become boring. "We are talking about the same thing happening again and again. I voted the last time but I will not vote on this one." Based on results from the first election and popularity polls conducted over the summer, it is most likely that Karzai will win this round, even if turnout is low. That is what worries Parliamentarian Daoud Sultanzoy. "The runoff will make the government less legitimate," he reasons. Even if Karzai wins, it doesn't mean that most of the population voted for him, he says. "The best scenario is that the people of this country have confidence and vote in a free and fair election. The worst case is that Pashtun areas will not participate in large numbers, and this will provoke ethnic strife." With their most recent announcement, it seems that the Taliban are already counting on this outcome.